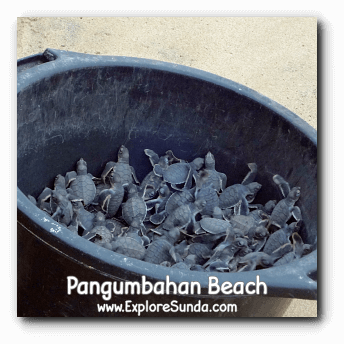 Pangumbahan beach is famous of its Sea Green Turtle (Chelonia mydas) Conservatory. There are several similar conservatories in other parts of Java island, but this one is the easiest to reach. Inspite of its name, the color of Green Turtle is not green. Usually they are brown. The green one is the green fat beneath its carapace. Every night green turtle females come ashore to dig nests and lay their eggs in the soft sand. The darker the night, the more sea turtle come. Hence, only few female turtles come during full moon. As a tourists, we are allowed to come and watch them lay eggs, but we are strictly prohibited turning on flashlights. Different tickets apply to see turtle lay eggs. 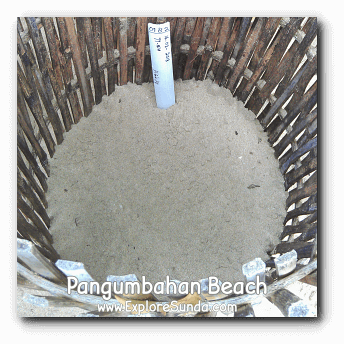 There are 7 posts along the beach, from Pangumbahan until White Sand beach. Each post is watched by a staff every night. These staffs wait and guard until the female turtle finish laying their eggs, then they mark the place. The staff will dig the eggs in the morning and move them to nursery. The nursery itself looks like a sand box. The staffs group eggs into nests and each nest has information on date taken, how many eggs in the nest (Some nest have more than 100 eggs! ), and approximate date when they will hatch (Usually it takes 2 months to hatch). Unfortunately, only half of the eggs can hatch perfectly in this nursery. The survival rate is so low, hence, the staffs start to test whether it would be better to let the eggs in their original nest built by their mother. But the downside of this method is it requires more staffs to guard the nest. Turtle eggs need to be guarded and protected from many of their predators. The most dangerous predator of all is human itself, since turtle eggs are favorite dishes in some communities. When the female turtles are ready to lay eggs, they will return to the beach where they were originally hatched. 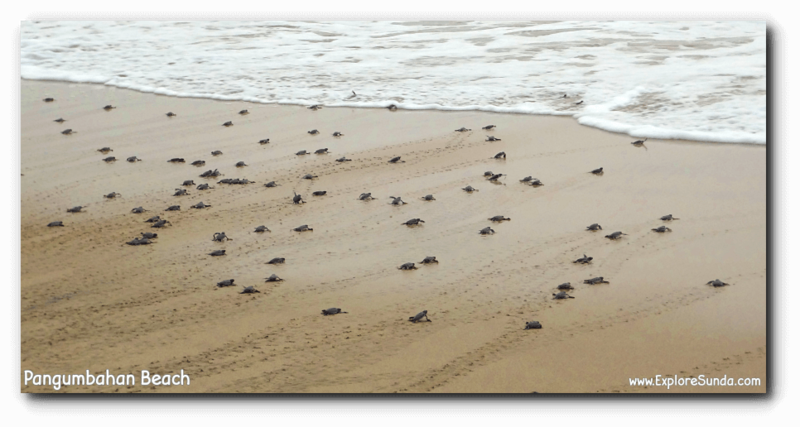 Hence, once the hatchlings leave their nest, they will return to the same beach after 20-50 years, if they survive. Green turtles lay eggs at night, and the eggs will hatch at night too! 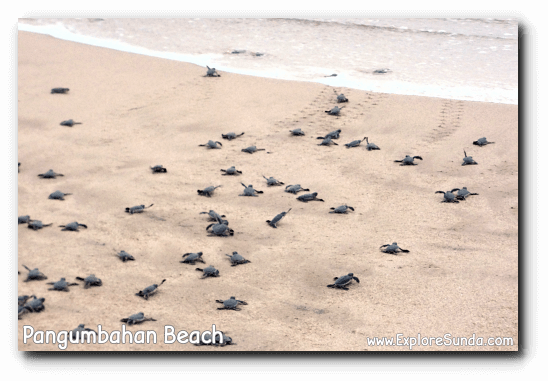 Then, instinctively the hatchlings will go directly to the open sea and start their journey. The same thing happens with eggs in the nursery. Once they hatch at night, the staff will collect them and put them in the dark room. The dark room will make them less active during the next day, so they will not eat too much of their baby fat. This baby fat is sufficient for the first 5 days of the hatchlings. Then the next sunset, the staff will free the hatchlings to the ocean. This is the most seek activity in Pangumbahan beach. The conservation staffs will bring the turtle hatchlings to the beach at 5.30 pm. Then they mark a line on the sand. As tourists, we are not allowed to cross this line and we are also not allowed to touch any hatchling. Next, the staffs will turn the baskets full of hatchlings down, so the hatchlings can start running to the ocean. It is a really tough challenge for these babies to be swept away by the waves into the ocean. Most of the time they are swept back to the beach instead of to the open water. Some nights there are many female turtles lay eggs on Pangumbahan beach, some other nights they are less, but every night there are turtles come ashore to lay eggs. It means it almost certain that every night some eggs will hatch. 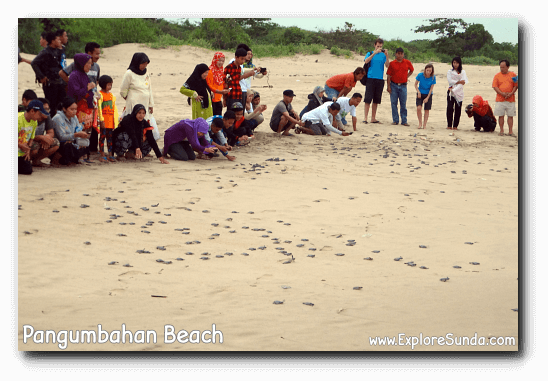 Thus, we will be able to see the conservation staffs release the hatchlings almost every sunset. Nowadays this Sea Green Turtle (Chelonia mydas) is already included in endangered list. As I mentioned earlier, turtle eggs are favourite dishes in some communities, the adult turtles are exotic soup in Chinese cuisine as well as required for religious offerings in some communities. Although the hatchlings are not sought after by humans, there are many predators, such as sharks, crabs, and shorebirds, threatening their survival in the ocean. That is why this conservatory plays important role in protecting Chelonia mydas. We also can help by supporting this conservatory and not consuming the turtle. 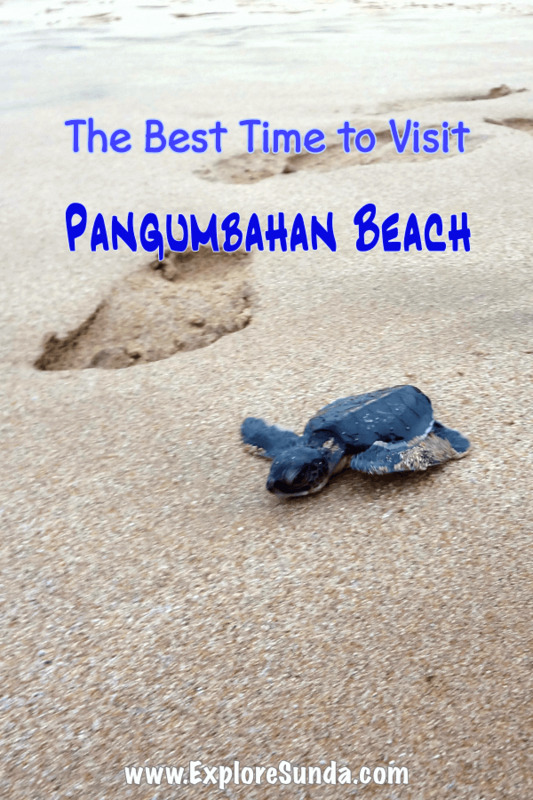 In addition to the turtle attraction, both turtle laying eggs and releasing hatchling to the ocean, Pangumbahan beach is a very beautiful and natural beach. It has wide brownish smooth sands and strong waves. These strong waves are not suitable for swimming though. The beach is relatively clean, the trash there are drifted ashore from the ocean. We usually play at the beach while waiting for the time to release the hatchlings. Once we finish playing in the beach and watching the turtle hatchlings swim to the ocean, we can clean up at the bathrooms in the Turtle Conservatory. We usually promptly return to Ujung Genteng beach afterwards, since it is a bit difficult to drive on bumpy and dark roads at nights. 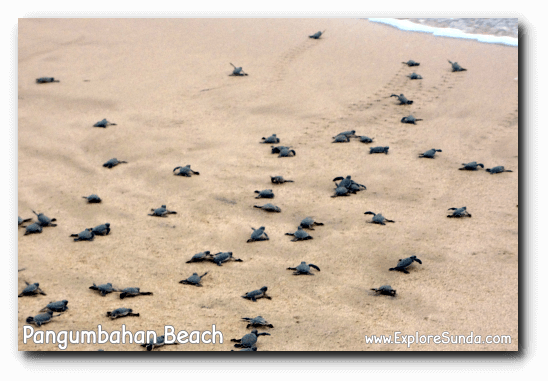 The only access to Green Turtle Conservatory is through Ujung Genteng beach. 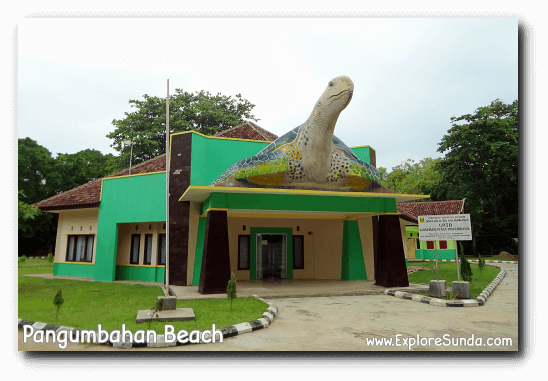 It is approximately 3 km (20 minutes drive) from Ujung Genteng to Pangumbahan beach. The coordinates are 7°19'49.5"S 106°23'46.7"E (-7.330402, 106.396317). We will pass some villages along the way. Usually visitors stay at one of the inns in Ujung Genteng beach, since there is not any accommodation, restaurant, or campsites near the conservatory. There are other places in the land of Sunda where we can observe wild and exotic animals. Taman Safari Indonesia in Cisarua, Puncak would be the number one in the list. But, if you prefer to see sea creatures, you should visit Jakarta Aquarium. Then, visit Taman Mini Indonesia Indah for its bird parks. Last but not least, Ragunan Zoo with its Schmutzer Center for the gorilla also has its own appeal. What do you say if you can walk inside a central bank's vault? Have you seen a mountain of gold bars? Experience them yourself at Museum Bank Indonesia!